Big Brother Spoilers > Big Brother > Big Brother 18 > Big Brother 18 – The First Look Inside the International Themed House! With Big Brother 18 set to premiere on June 22, its unusual to get a glimpse inside the newly redesigned house this early. We usually wouldn’t get to see the inside of the house until approximately a week before the premiere. Last week we showed you the leaked photos of the totally redesigned backyard pool and hot tub. 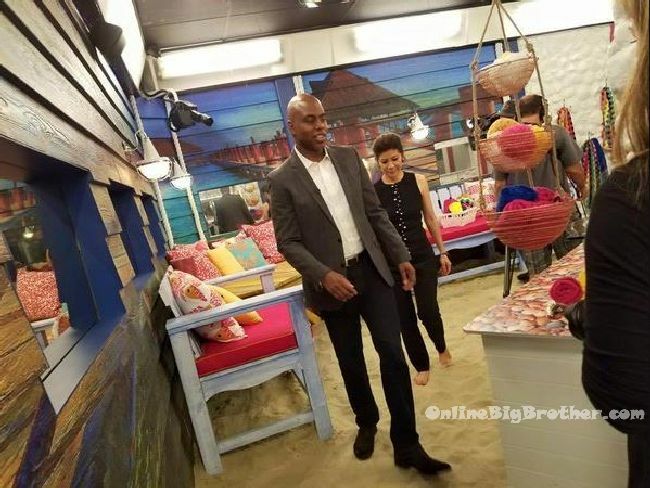 With the newly leaked photos of Entertainment Tonight’s reporter Kevin Frazier touring the house with Big Brother host Julie Chen, I’m starting to think these are planned leaks of the house to create early buzz about the season. Take a look at the house and tells us your thoughts! Will the international themed house also have international house guests, similar to Big Brother Canada 4? 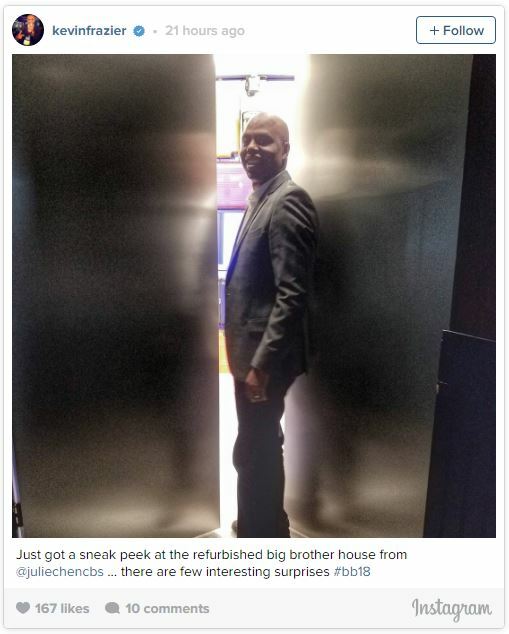 Yesterday, Kevin Frazier teased us with a photo of him entering the big brother 18 house. He described the newly redesigned house as “refurbished” and suggested there are “a few interesting surprises”. Subscribe to CBS All Access to get exclusive content and the Big Brother 18 Live Feeds. Today, twitter user @89razorskate20 released leaked photos of the Kevin Frazier touring the house with Julie Chen. 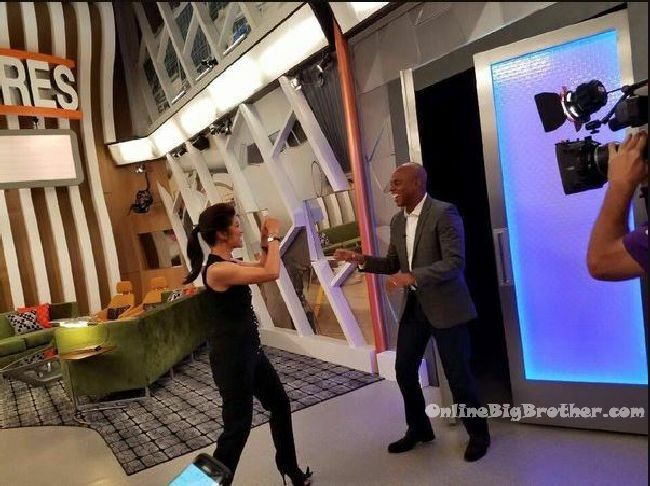 The photo below shows Julie Chen greeting Kevin as he comes through the front doors. The house previously only had one door but it has now been expanded to double doors. 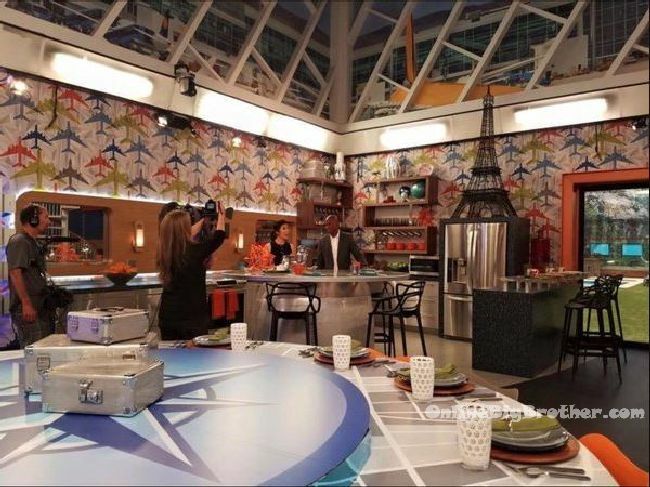 The next photos is of the kitchen, where it shows off the international theme. The walls are covered with a wallpaper of planes and on top of the fridge is a large Eiffel Tower statue. The next photo is of the bathroom, which has an exotic beach theme with sand on the floor and wall coverings of the ocean and a pier. 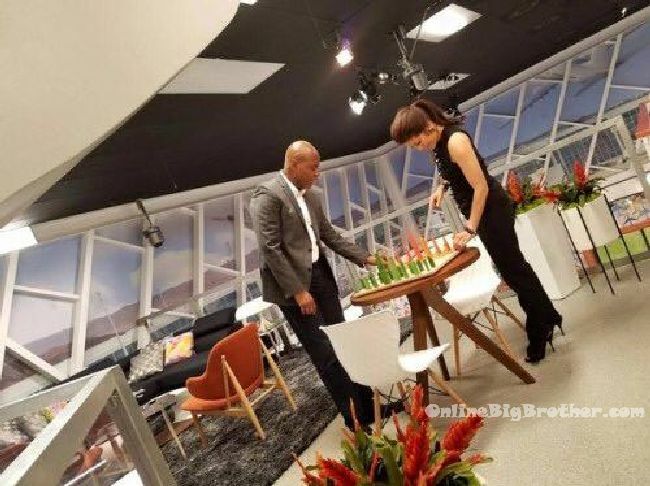 What big brother house would be complete without a chess board for the house guests to size up their strategic competition. Continuing with the international theme, the walls show a plane taking off. Subscribe to the BB18 Live feeds and try them out for FREE for 1-week!. DAWG u think whoever stared on TRIP will be in the house just like surviivior season 34? Could be… you never know … but I doubt it. ya i know but caleb is back in season 34 survivor i think it great twist to! Nikki Grahame did say in a post BBCAN4 interview that she would be in Lad Vegas just before and LA around the time of BBUS. Any leaks on if we have all newbies or a vet mix as houseguests? Nothing confirmed yet… but hopefully we’ll get something soon! Anyone know when Rachel Reilly is supposed to drop calf? I thought she might just do it on Drew Carey’s shoes what with all the hoppin’ and screeching. What’s the sand for in the john? A litter box? If they did all-stars, I’d be curious to see who they invite back. I’m fine with some international houseguests as long as they don’t bring in any phony and insincere people like Tim. Tahan from Tim’s BB Australia season would be an awesome choice. She is highly intelligent, competitive, athletic, and extremely beautiful. Tahan finished third only because of the unique voting dynamics created from the specific houseguests who made it to final three (the winner was chosen from the final three by viewer vote). I think the producers would be very open to considering international houseguests as there is a lot of available footage of them for review and they have already proven to be very comfortable in front of a TV camera. This brings a pretty high level of predictability as to how they would conduct themselves in the BB USA house. All this beachy theme stuff to see and I can’t get the word “crabs” outta my head…..
Looks Decent this season, now can we get a decent cast this year? We need more people like Dan who don’t mind getting their hands dirty. I’m so tired of these house votes!!! Fix the game Allison it’s broke!!!!! Can’t wait for the new season. Only thing that makes summer in the blazing hot desert worth living. Thanks Dawg for the updates to the new Season! – I am so excited I can hardly wait. Part of me thinks with this International theme within the House, they are going to do the same thing as BBCan but instead of them ever having played BB before they are new players as well. I hope that is the case anyways and no one has ever played BB before. I don’t get the sand in the bathroom. Out of the shower onto sand sounds like a mess to me. And please no Frankie Grande. There’s no gas shortage where we are in BC. I haven’t heard of a gas shortage anywhere else. It was on the news in Houston with a company named Suncor and also the Vancouver Canada news made reports about it. It supposedly had stemmed from the Fort Mc Murray fires. Interesting. I didn’t see that news story. I could see there being issues stemming from the Fort McMurray fires though. Yupp Kelowna haha, That’s where I’m from, they are slowly starting to fill up again though; but so expensive! Good to be back! Again before starting up want to thank simon and Dawg for their continuous effort with the best spoilers on the web! Some rumor mills: the general concensus seems to be some sort of Newbie vs. Vet format (which I personally am not a fan of). I like all of one of other….13 was fixed for Rachel and an even-number of the two will just be dominated by the Vets. The popular rumor seems to be a Villians theme with newbies pitted against our least favorites like Austin, Frankie, etc to name a few. 1. ***Battle to be a houseguest. Either returning house guests, newbies, or a mix will battle to get a spot in the house…aka 30+ people on opening night get dwindled to our cast. I am personally a MAJOR fan of this cause those who want it the most are likely to play the hardest. I had read it may be 15 vets fighting for 8 spots and 15 fans fighting for 8 spots. 3. Diamond POV on a weekly basis. To elicit drama, the winner of the POV comp will get th Diamond veto allowing he/she to name the replacement nominee as long as it isn’t the HOH (in what I think is an attempt to avoid floaters since it truly become your only safety to win a comp or be forced talk game). one HELL of a summer. Cheers to the rumor mill! The group that spoiled the twin twist last year made some interesting comments today…. -Seems that families is going to be in-play to some extent as Vanessa’s sister seems to be involved in some way…unsure as to whether this will include the original cast members. -Also seems to be spoiled that Julie will NOT READ the final vote count anymore once someone is evicted in hopes that more people will begin to go rouge. 12 Superfans will face off against 4 Supervillains. 2 of those 12 to have a relation to the 4 veterans (hence the Vanessa sister rumor). I hope these rumors are false. I always like it when the players have a degree of ignorance about the game. Makes for a more exciting unpredictable season. With that said CBS’ definition of super fan is a bit different than the rest of us. If they bring Vanessa back I just might shoot myself in the head. Big Brother 18 – Second Set of Big Brother Alumni VIP CHATS!